Welcome to the Hebron Wisconsin Campground! The Hebron Campground sits on about 6 acres of well maintained landscape that offers a wooded setting along the Bark River & a fishing pond. Here, a variety of birds will wake you in the morning, entertain you all day long, plenty of fresh air, and the fish are always biting. Whether you're a tent camper or prefer the added features of a pop-up or travel trailer, we have a great campsite for you! 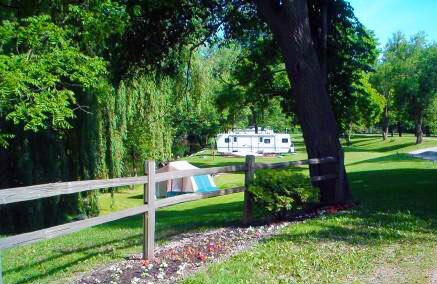 We have 48 spacious campsites that never crowd our campers. Most offer water and electric hookups. You will have a picnic table and fire ring. 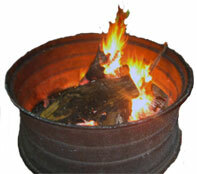 In the evening, enjoy campfires and star-filled skies! The Hebron Campground features restrooms with hot showers. A dump station is also available. Bring your bike or hike on the trails in the beautiful Kettle Moraine State Park. Bring your canoe or kayak (you can launch from your campsite) and paddles some hours away. Alpine Valley music grounds are minutes away. There are many things to see and do in Jefferson county and southeast Wisconsin. Come and be our guest!